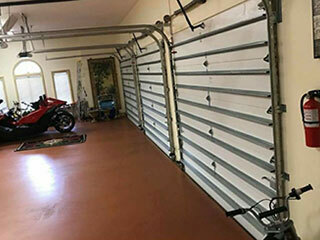 While your garage door system may seem sturdy and practically invulnerable now, over time, its different parts will inevitably begin to wear out and break down. When this happens, the damage may often be minor, but a lot of times it could lead to a major breakdown, which will render the door inoperable until it is repaired. In order to help homeowners avoid these annoying and – not to mention – dangerous scenarios, we started offering regular maintenance appointments. During these service visits, our technicians will perform a variety of tests and adjustments that will ensure your garage door is in the best shape it can be. We'll lubricate all the moving metal parts that could suffer from friction, such as the torsion springs, rollers and hinges, and we'll conduct a thorough examination of the system as a whole, making sure to inspect everything from the panels to the tracks to see to it that no minor damage is left unfixed. Of course, one of the main focus points of our garage door maintenance service would be to ensure the system is safe for you and your family to use. That's why will check the safety sensor alignment of your opener's photo eyes and readjust their position as needed so that they're able to properly detect obstacles. We'll also test the auto-reverse feature of your door and make sure that it does open back up if it encounters a little resistance. By making sure your automatic system receives the proper care it needs, you'll be able to minimize the risks and accidents and increase its working potential by a very significant margin. Contact our team at Garage Door Repair Cedar Park today to schedule a maintenance appointment with our experts.